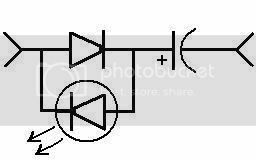 Heres a really simple circuit that I made to flash an LED using the guts from an analog clock mechanism. Just remove the coil and connect this circuit to the two outputs. You'll get a two second flash rate. First pulse will charge the cap, the next will put the cap and battery in series with the LED, making it flash. You can use any old diode, I used a 100uf cap and a red LED. I was talking about the ones you put an AA battery in. You can find them cheap at the dollar stores. I like that this circuit works from such a low voltage and for so long I could probably put a big 1.5 V battery in it never have to change it!